Grave matters are treated with wit and erudition in this study of premature burial throughout Western history, from physician Bondeson (The London Monster, 2000, etc.). When one 18th-century French proponent for burial reform wrote that “Death is certain, since it is inevitable, but also uncertain, since its diagnosis is sometimes fallible,” he was living in a time when feather quill tickling, urine mouthwashing, and tobacco smoke enemas were all advocated as instruments in the precise diagnosis and certification of death. Bondeson’s macabre study begins in European antiquity and moves swiftly through the medieval superstitions and Renaissance legends. The bulk of the text deals with the period from 1750–1900 in Europe and America, years that correspond with the development of Western medicine as we know it. The author, a doctor himself, exhumes some fascinating material—from the history of the German Leichenhauser (waiting mortuaries—where bells were tied to the fingers of corpses should they bestir and shake themselves back to life) to the literary and philosophical overtones of the French debate on accuracy in death certification. Quacks, eccentrics, and charlatans run as rampant as earnest medical reformers throughout Bondeson’s account, while the forces of ambition and greed are as constant as those of fear and humanitarianism. He follows the history of premature interment up to the present day (yes, Virginia, cases of premature burial still occur), and one digressive chapter deals with the depiction of premature burial in art (particularly books and movies) from Edgar Allan Poe to Roger Corman. 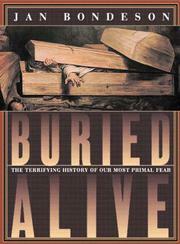 The impressive medical history uncovered by the author’s thoroughgoing research is well-presented and somewhat better than his argument (which falls somewhat by the wayside) that the fear of premature burial was ever as widespread as he suggests. A necrobibliac classic (in the tradition of Nancy Mitford’s American Way of Death): it may keep you up all night—not from fear but from fascination.